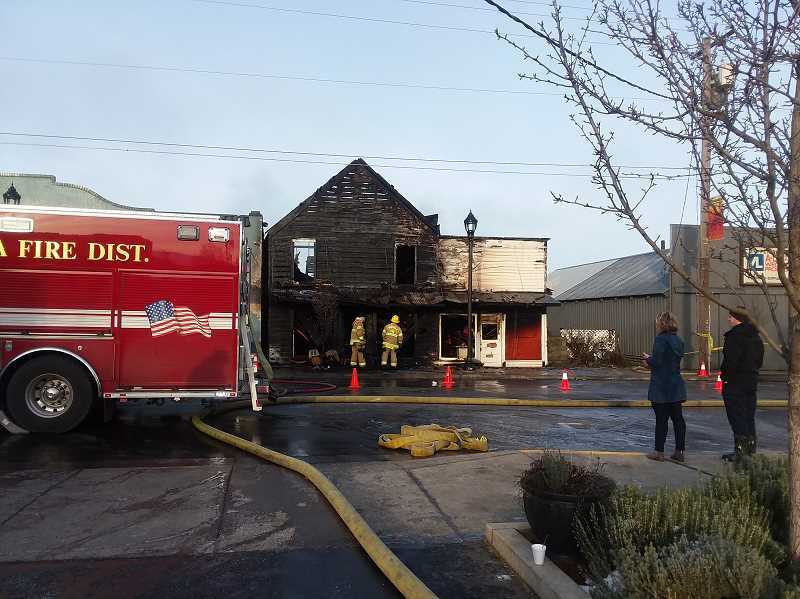 An old boutique in downtown Molalla went up in flames Wednesday night near the intersection of N. Molalla Avenue and W. Main Street, spreading to nearby buildings. One person escaped, and one remains unaccounted for. The 3-alarm fire broke out at about 11:45 p.m. on Wednesday, Feb. 6. 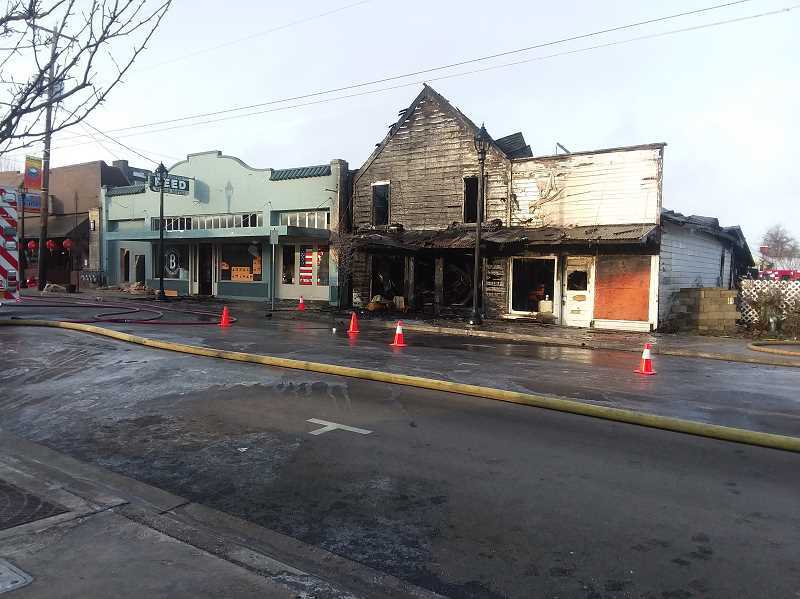 According to Molalla Fire Public Information Officer Todd Gary, the primary building, "the boutique," where the fire started was comprised of wood and was built partly in the 1800s and partly around 1920. Freezing weather further contributed to difficulty fighting the fire. Fire crews did not immediately realize that two people were living upstairs in the building. Gary said the elderly woman who lived there awoke to the smoke alarms and came out of the building. But her son, a man in his fifties, is missing. "He did not come out," Gary said. "We've exhausted everywhere he could be. We're now looking through; crews are doing an investigation and looking through the building." The building is so damaged that crews are having to use a track hoe, Gary said, to pull the pieces of the building apart as they investigate and look for the missing man. Crews consider the site a crime scene while the investigation is taking place and because there may be a fatality, but Gary does not expect foul play. "It appears to be an accidental fire," he said. He said the fire district does not currently have any indication as to the cause of the fire. The damage to the affected buildings is extensive. According to Gary, the boutique is a total loss, with the second floor collapsed onto the first floor and the roof caved in. The neighboring Bentley Feed store is also damaged, with about 50 percent of its roof caved in. "There will be extensive rebuild there if they rebuild that building," Gary said of the feed store building. Additionally, Thai Yo Sushi sustained smoke and water damage, and is currently closed, Gary said. As of Thursday night, crews were still on scene investigating.